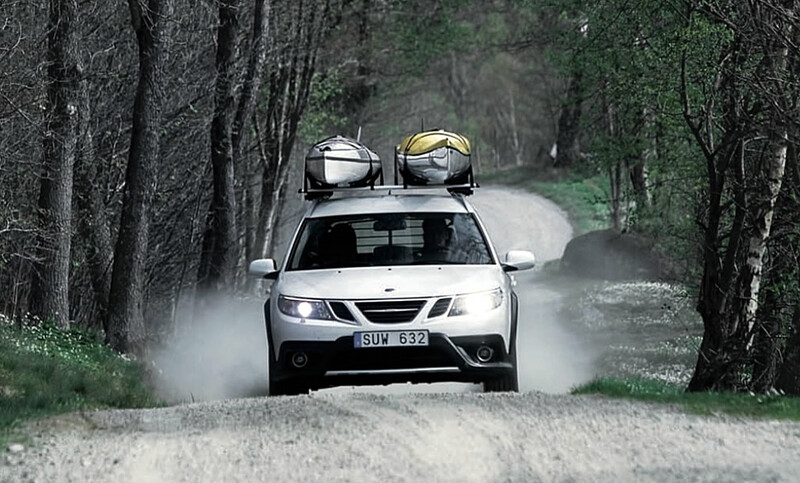 We invited a super-active couple from Trollhättan to test-drive the new Saab 9-3X to see how it matched up to the needs of a sporty, adventurous lifestyle. It’s mid-morning in Gothenburg and spring is in the air. We’re driving north, heading towards some of Sweden’s inland waters to meet our super-sporty test drivers. 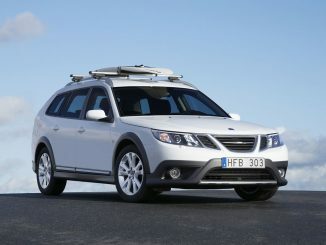 They’re not difficult to find: they’re stood alongside a striking Saab 9-3X in Arctic White. This car certainly makes a statement. Its powerful stance makes it look ready to drive – anywhere. The 9-3X is a sporty, rugged addition to the Saab 9-3 range, offering the perfect vehicle to those who love the outdoors but don’t want a large crossover. Also, for the first time, Saab has combined its cutting-edge XWD with a BioPower engine. 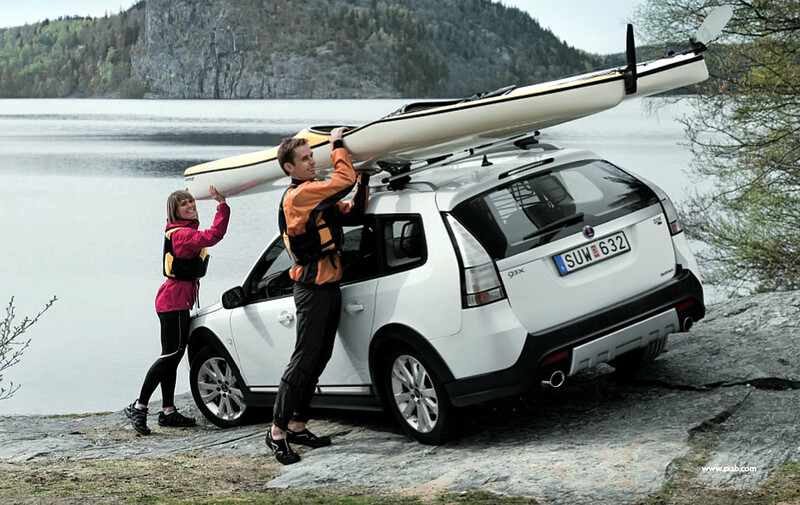 Such an active couple clearly needs a car that can meet the demands of an adventurous lifestyle, and the new Saab 9-3X has been designed for just that. We take a walk around the car. The raised chassis gives the car a higher stance that looks ready to handle rugged driving terrain – specifically designed for those who frequently hit gravel or unpaved roads, without compromising the driving experience on tarmac. “The XWD is perfect for us,” explains Magnus. “In many of the places where we compete, the roads are pretty bad leading down to the water, and we need to unload our equipment as close to the water’s edge as possible. It’s great that this is available in a mid-size car. It’s time to drive, and the Swedish culture of being close to nature is instantly apparent as we leave the highway for some of Sweden’s smaller roads. The first thing Maria comments on is the white carpet of flowers on either side of the road. “These flowers signal the first sign of spring,” she smiles. For the first time, Saab has combined its cutting-edge XWD system with a 2.0-litre turbo BioPower engine (210 hp / 154 kW / 300 Nm), combining a bioethanol capability with all-wheel drive. The sporty styling is also complemented by a six-speed manual gearbox. We drive down the dusty track towards Lake Hällungen and the XWD means the car grabs the road with all four wheels. Parking up to unload the kayaks, the 9-3X looks right at home in this rugged environment. 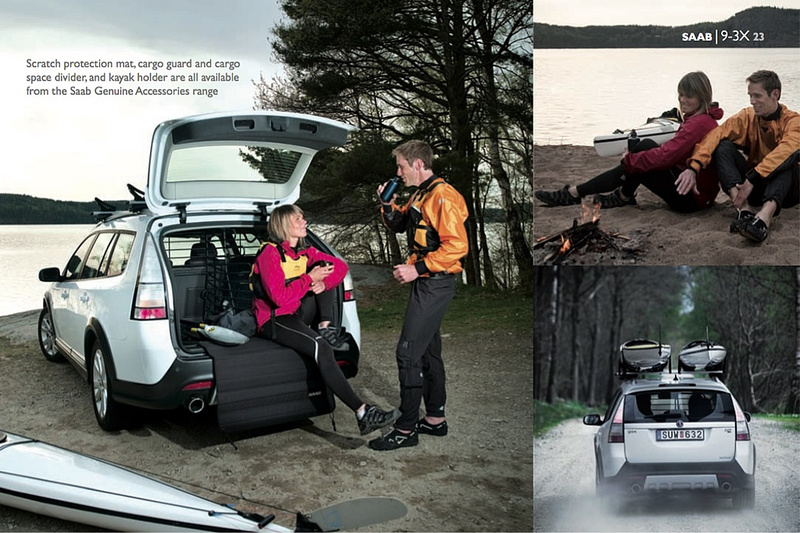 Today they are kayaking and, as they unstrap the kayaks from the kayak holder on the roof, Magnus and Maria discuss the exterior details of the car. Front and rear bumpers, side sills and the edges of the wheel arches have a dark grey, grained finish offering protection from loose or muddy terrain. Skid plates with a matt aluminium finish curve up towards the door opening at the rear, and visible twin round exhaust tailpipes complete the ‘ready for action’ look from behind. Multi-spoke 17-inch alloy wheels add to the 9-3X’s character and reflect its ability to handle mixed road conditions. As they open the rear door to unload their paddles, wetsuits, life vests and bags, the spacious cargo area becomes apparent. “There’s so much space in here for such a compact car,” says Maria. “You wouldn’t expect this much room for equipment.” The 9-3X has been designed to make loading sports and leisure equipment easy. The compact design of the rear suspension allows a deep, box-like space for cargo, offering a useful rear seat up/down volume of 477/1331 litres (VDA). The 60/40 split rear seat-back incorporates a ski-hatch and folds down without any need to move the fixed seat cushion.The fold-down front passenger seat-back also makes it possible to carry items up to 2.5 metres in length. The fully carpeted rear load space is illuminated by two interior lights and is accessed by a lightly weighted tailgate that opens down to bumper level, its damper rods completely hidden in the roof to allow a clear, uncluttered opening. The 9-3X’s TwinFloor stowage facility is also perfectly suited to transporting bulky equipment, helping keep luggage and equipment safe and tidy.A 12-volt power socket in the main load area for a hot or cool box and the separate storage compartment on either side of the floor (one with a moulded holder for larger bottles) are clever finishing touches that highlight Saab’s attention to detail. Magnus and Maria relax by a small fire on the beach after their kayaking. As we chat, we discuss their infectious attitude towards life. “We are both fascinated by ‘life motivation’,” explains Maria. It’s this ‘life is out there’ attitude that underpins the thinking behind the Saab 9-3X – a distinctive impression of Saab’s Scandinavian inspiration that has been created to take people closer to their goals.